What technology does the heater incorporate to modulate power to the heating elements in accordance with changes in water flow rate and incoming water temperature? What level of technical assistance and warranty support is available? This represents the most crude and basic technology. In this case, the heater only has one power setting and does not compensate in any way for changes in incoming water temperature or flow rate / pressure. These are unsophisticated models and are prone to many problems in the field. They are not suitable for whole house use. This is a slight variation on the above, except that the user can adjust the power output setting of the heater. In applications with consistent flow rates from faucet to faucet on a city water supply with steady pressure, this type of heater can provide satisfactory performance. For this reason, they can make economical point-of-use heaters for applications where the flow rate is always the same. Water temperatures will also fluctuate when additional faucets are turned on or off during use. This type of heater does measure the flow rate of water and will modulate overall power output by turning heating elements on and off. The problem is that most tankless water heaters only have 2 to 4 heating elements, so the range of control is still pretty limited and "stepped" rather than continuous. 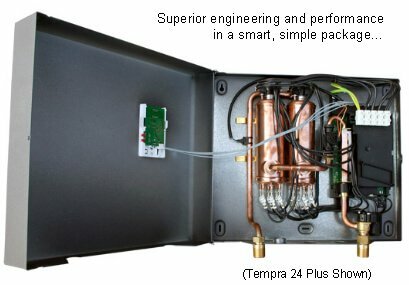 This is the most advanced type of electric tankless water heater available. This type of heater constantly measures the water flow rate, and both incoming and outgoing water temperatures to modulate power to the heating elements as changes are detected, thereby maintaining a precise output water temperature at the level selected by the homeowner/user. Set it and forget it! The Stiebel Eltron tankless water heater features an advanced mico-processor-controlled temperature management system. A series of flow and temperature sensors monitor the water flow rate and incoming water temperature and send this vital information to a micro-processor which then modulates power to the heating modules to maintain a precise output temperature as selected by the user. A convenient digital display indicates the temperature setting. Stiebel Eltron Tempra Plus Series tankless water heaters feature the industy's only advanced flow control technology that actually senses when you exceed the capacity of the heater and compensates by adjusting the flow rate to ensure that the desired output temperature can still be maintained at a consistent level. The result: a comfortable, satisfying experience every time, all the time, no matter what! Stiebel Eltron tankless water heaters are made in Germany by a company that has been in the business of manufacturing electric water heaters since 1924. The company's factory is the only tankless water heater plant in the world that is ISO-9001 certified. The Stiebel Eltron Tempra Series features copper heating chambers and the unit is protected by sturdy powder-coated steel case. Many competitors use inferior plastics to save costs. In addition to offering a comprehensive warranty, Stiebel Eltron offers industry-leading technical support resources. Of course, as an authorized dealer, our fully trained tech support staff is also available to assist you. At the end of the day, price still matters. As a homeowner or business, you deserve the best value for your dollar. Not only does the Stiebel Eltron tankless water heater deliver the most advanced technology, top notch quality, and expert technical support, it offers it at a very competitive price. In fact, a comparably-powered models from many competitor's costs hundreds more, yet offer less technology.